I receive regular updates from the PictureCorrect website and they are ALL very useful to any photographer, whatever level they are at. The related site at PictureSocial is a place where photographers can set up their own pages and blog, with the ability to add photographs they have taken…One of my posts was taken up a while back as well….which was a great boost! So – why the intro?! 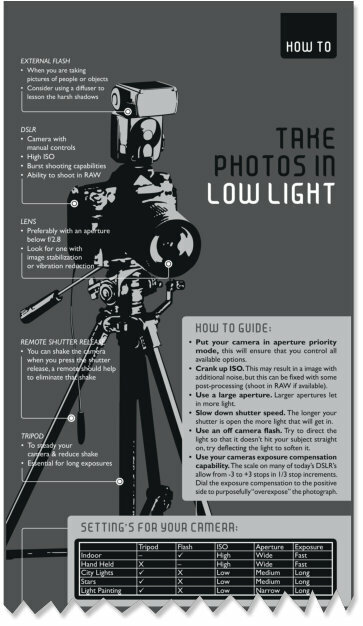 I received an email this morning from PictureCorrect with the title: Low Light Photography Tips and there is an Infographic that I thought my readers would like – also a chance, for any who are not aquainted with PictureCorrect, to let them know about said sites. 3. Slow down the shutter speed. More light is captured the longer the shutter remains open. Keep in mind that a good “rule of thumb” for clear hand-held shots is no slower than 1/60th of a second. Use a tripod if you’re shooting at anything slower than that, though I have had success at slower hand-held shots using lenses with image stabilization. 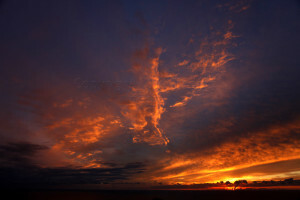 Information provided courtesy of Snapsort and their article on Low Light Photography. Landscape photography at night can be be difficult to capture, but it holds the potential to reveal images beyond what can be seen by the human eye. This popular in-depth guide, which we have an exclusive deal on for only 2 more days, is the product of three intensive years shooting & refining techniques all over the world. Those tips are additional to the infographic shown as a scrollable PDF below (there is also a download link and the PDF is sharp as a pin!). Add your comments to the form below – we would love to hear your thoughts on this well sought after topic! Time for a Break? A good book to read!